It happened when she was a teenager doing community service work at a state psychiatric hospital in Lexington, Kentucky, where her father worked as a psychiatrist. It was there that Gillian LaRue discovered her passion for psychology. In fact, after she earns her doctorate at SOPP, LaRue would like to work at a state mental hospital helping patients who are severely mentally ill.
LaRue grew up in Lexington, where she volunteered at Eastern State Hospital, a state-owned psychiatric facility. She graduated from Tates Creek High School in 2007 and enrolled at the University of Kentucky to study psychology. After earning her bachelor’s degree in 2011, she stayed in Lexington and continued volunteering at Eastern State and in a stroke and spinal cord rehabilitation research lab at Cardinal Hill Rehabilitation Hospital, which provides comprehensive rehabilitation services for recovery after stroke, brain injury, spinal cord injury or hip fracture. She later returned to the University of Kentucky to earn her master’s degree in counseling psychology. “I knew I wanted to do something to deepen my intervention skill set and integrate it with the evolving evidence base in the field,” LaRue said. After graduating in 2015, she enrolled at Wright State’s SOPP to pursue her doctorate in psychology. Last year, LaRue was elected treasurer of The Association of Black Psychologists’ Student Circle board. As treasurer of the board, she creates the budget, allocates funds and is in charge of student scholarships, helping select recipients. The Association of Black Psychologists was founded in 1968 in San Francisco and is headquartered in Washington, D.C. Its mission is to promote and advance the profession of black psychology, influence social change, and develop programs in which black psychologists can help solve problems of black communities and other ethnic groups. The association’s Student Circle consists of several hundred students on college campuses nationwide. Its mission is to increase the academic and professional development of its members. Members of the Student Circle have access to scholarship opportunities, leadership development, professional networks and scholarly writing opportunities. In July, LaRue attended the American Psychological Association’s Minority Fellowship Program’s Psychology Summer Institute, a weeklong training in Washington, D.C., in which attendees are taught about developing projects focusing on issues faced by ethnic minorities. 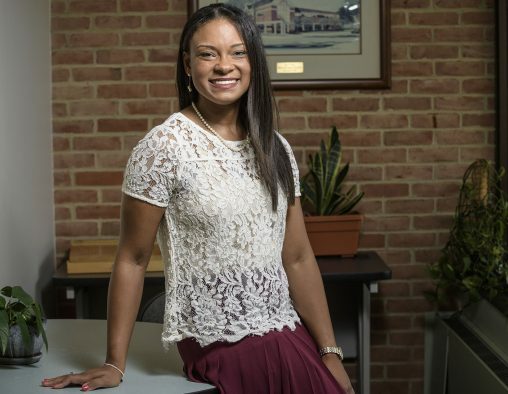 It was there that she was assigned a mentor and helped to fine-tune her proposal to create a program for the trauma-informed care of African American males in the criminal justice system. The institute provides educational, professional development and mentoring experiences to advanced doctoral students of psychology and psychologists who are in the early stage of their careers. Participants are guided toward developing a proposal, postdoctoral fellowship, dissertation, treatment program, publication or program evaluation project. All projects must focus on issues affecting ethnic minority communities.